This species is not particularly aggressive and may be bullied by more aggressive tankmates. The base colour of this species is brown, but with the right feeding, the adults should develop an attractive purple sheen. Omnivorous - does well with flake or pellet foods designed for african cichlids. Suppliment with fresh green vegetables such as peas, romaine lettuce, spinach or zucchini. I. sprengerae is one of the easiest mbuna to breed due to their small maturity size (4 cm). Their breeding will be rather constant when they reach maturity, breeding whenever possible. Their fry counts will range anywhere from 5-50. 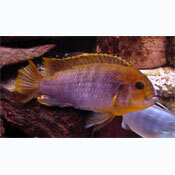 Other african cichlids. Some more timid species such as Haps or peacocks would do well with this species.